Environmental stewardship is now common in all aspects of our lives. Just look around you while you are reading now… there likely is an example close by. Recycling receptacles, energy efficient lighting, low-volume water fixtures. The transition to “green” is no longer just a fad that is dictated by a person’s political affiliation or geographic region. Protecting the environment is recognized as a moral responsibility. Sports field and parks maintenance departments are realizing that going “green” is not a complex issue. Rather it is a basic use of simple conservation. Ironically, maintenance budgets are becoming financially “green” by adopting new methods and technologies to reduce waste in order to save the environment. For sports field and park maintenance departments considering options to become more environmental friendly, it can initially seem as a daunting task. But to start, there are five pieces of a maintenance program that can have the largest environmental impact. 1) nutrient management, 2) pesticide usage, 3) equipment fleet management, 4) irrigation practices, and 5) field paint. Focusing on these five elements will initiate the “green” direction of a program. Let’s examine each of the pieces and explore the potentials for evolution in the maintenance program to protect the environment and to save money. Evolution Potential for Maintenance Programs: Technologies in both granular and liquid fertilizers allow managers to exert more control over their plant-feeding program to avoid wasted fertilizer that could potentially pollute. Many granular technologies are based around the timed “release” of nutrients. Some are controlled by chemical formulations, some have special “coatings”, and others use basic mineralization. All of these different release methods provide turfgrass managers with control over the quantity of each nutrient they want to provide a growing turfgrass plant. The fertilizer’s known technology, along with historical data for soil temperature fluctuation and weather conditions, can be combined using computer graphs to create an efficient, season-long granular program, eliminating waste and over-fertilization. In addition, regular soil testing provides a base line of plant available nutrients in the soil and will supply the estimated nitrogen release (ENR) from organic matter present. Soil testing 4-5 times a season can illustrate to a manager the need for macro and micro- nutrients. Tracking the ENR provides the ability to cut back on nitrogen inputs as the soil microbes break down the organic matter and release nitrogen. The slow release technologies, accompanied with regular soil testing provide managers the ability to reduce their over all inputs and ultimately reduce costs on fertilizers and on fungicides needed to control plant diseases caused by deficient or excess fertilizers. Liquid fertilizer and bio-stimulant use is growing in the sports field maintenance industry because of the increased growth control they provide to managers. Foliar fertilizers are readily available for the plant to absorb and use quickly and efficiently to reduce the total amount needed. Foliar fertilizers are able to supplement fungicide programs and help the grass plant withstand diseases and traffic as well. Overall, the usage of foliar fertilizers and bio-stimulants gives managers the ability to grow a stronger, healthier plant by using less material and providing non-harmful, naturally plant-occurring compounds. Environmental Impact: Historically, some pesticides have been non-selective in the “good” or “bad” pests that they can kill, earning a connotation of fear for the word “pesticide”. Fungicides are important in the battle to combat turfgrass diseases. Stress conditions from weather and foot traffic make the grass plant susceptible to invasion from disease pathogens. Fungicides aid in the battle against the attack of diseases during these stress times. Likewise, a healthy grass plant has some of the same natural responses and energy reserves to fend off disease and consequently withstand more traffic. Balanced fertilization, proper water amounts and timing, continued soil aeration, and appropriate mowing height; all are steps toward a healthy plant with strong cell walls, deep roots, and energy levels to withstand stresses and diseases. Advancements in insecticide technology are providing some of the most dramatic environmental differences for managers of sports fields and parks. For example, a grub control product that has come to the market is from a new chemistry class that requires no signal word on the label. The chemistry is based on a naturally occurring substance found in the bark of Ryania, a tree and shrub species. This technology is not required by the EPA to include a safety signal word on the label after acute toxicology testing showed no har m to humans, birds, or fish. Therefore, grubs – one of the most common and destructive insects on cool season turfgrass – can now by treated without any danger to the environment or patrons on the fields or in the parks. Other products and companies are involved in creating natural occurring technologies as well. Even natural substances such as garlic oil and cedar oil can be used to reduce populations of nuisance insects such as gnats, ticks, and ants. Additionally, new turfgrass plant genetics creating stronger and healthier plants that can withstand more damage from diseases and insects. The stronger plants raise the threshold for treatment from pesticides completely. A fleet of maintenance equipment, mowers, utility vehicles, and tractors, among others, rely on petroleum products to operate. Gasoline, diesel fuel, oils, and grease are all big expenses. Additionally, operating such a large fleet of equipment constantly emits exhaust into the air during a workday. Water is our earth’s most valuable resource. Overuse and waste of water not only impacts our overall water quality, it also adds to disease pressure on stressed turfgrass and washes fertilizers through the soil more quickly. When considering water conservation and irrigation, turf managers should strive to water efficiently and purposefully. The effects of improper timing for watering are harmful. Not only is water wasted but the likelihood of disease outbreaks increases because of prolonged periods of leaf wetness. Overwatering is also harmful. Roots are damaged when overwatering takes place as the water reduces the air space in the soil and the nutrient food bank is lost because the water washes them through the soil profile. Improvements in weather forecasting resources to monitor weather conditions provide valuable information for reaching maximum watering efficiency. Wind speed and direction, humidity, and UV index are all factors that lead to evapo-transpiration (ET). ET is the term used to describe the amount of water lost from the soil during a given day. Monitoring the precipitation forecast in combination with the actual ET and ET forecast, can help determine whether to wait an additional day for irrigation or until a rain event. 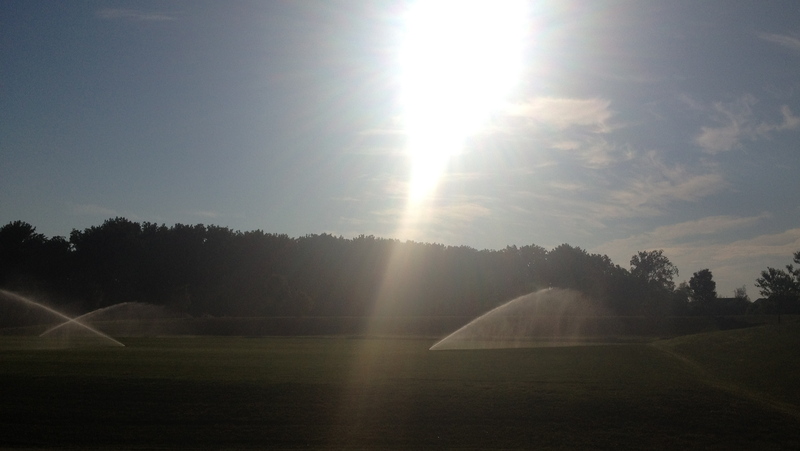 Larger or busy facilities should consider the merits of a paid subscription weather service as well as employing real-time consulting services to be able to make better decisions on watering. The money savings from skipping only a few watering cycles will pay for the subscription. Additional technology such as rain and wind sensors should be used in a water conservation program as well. These sensors can be installed on irrigation satellites to stop watering if sufficient rainfall has been received or if wind is gusting as to cause the water to blow off target. High-efficiency irrigation heads should replace aging irrigation heads that are leaking at the base seals and water pressure should be monitored in order to use the correct nozzles to reduce misting. Aggressive aeration also helps with water penetration so that less water is required to soak into the soil and lessens run off. Water is a vital natural resource, and everything must be done to use it efficiently. Sports field paint historically been considered at least somewhat environmentally “safe” as these water-based paints break down relatively quickly. However, the colorant in these paints still holds VOC’s (volatile organic compounds) that could be harmful for the environment. These VOC’s are known pollutants to the environment that do not break down quickly. A soccer field has nearly ½ mile of lines to be painted each week. A football field has over .75 miles of lines prior to numbers, hash marks, and logos. Because of this large volume of paint being used, it is important to be mindful of the VOC content that is being added to the environment. New paints are now available with low or no VOC content. Your sales or paint manufacturer can give you the exact VOC content of the products you are using. According to studies at Colorado State University and North Carolina State University, well maintained turfgrass sequesters up to .45 tons of carbon from the atmosphere per year. So the turfgrass in a park or large sports facility has the ability to remove the carbon amount equivalent to the emissions of driving a car from Washington, DC to Los Angeles, CA 45 times. As maintenance programs continue to evolve to reduce carbon inputs, sports fields and parks will be able to improve the overall quality of the environment and save money. Certainly there are many more parts of a program where environmental protection can be found. But examining the standard approach in each of these five areas begins the journey toward long-term results for environmental protection. In addition, facilities will save money along with providing a more quality experience for the visitors and players who frequent the fields and parks. Yet most importantly, the environmental stewardship sets an example for the young patrons of the parks to follow. These young patrons are the sports field and park managers of the future that will carry on your example of environmental stewardship. Transition Zone Bermudagrass: “Out of Gas” This Spring? ?